The St. Paul’s Curriculum Review Process is called “ACTION GROUPS,” in reference to the work by Instructional Coach Extraordinaire Elena Aguilar (1). The goal of the action groupwork is to expand our ability, as a school and as teachers, to take action and improve our curriculum. Students need teachers who are just as interested in their own growth as they are in their students’ growth, and the action group process is designed to foster this ability to grow. One way to look at curriculum review is to picture it like a family cookbook. We have some slam dunk recipes that have been passed down over generations, and we have some new ones added from the best, latest cookbooks. Some recipes have been tweaked so they are healthier, and some have been outright eliminated. No matter what, we keep the cookbook alive, jotting down notes, adding and subtracting ingredients, changing techniques with new kitchen technologies, and multiplying quantities for more guests. The St. Paul’s teachers are like a team of chefs working together, not to cook a meal, but to design learning environments where students grow closer and closer to the graduates described in the Portrait of a Graduate. In a family cookbook, you have a recipe template with ingredients and a series of steps. At St. Paul’s, instead of a recipe template, we use a five-step process (2) based on the Understanding by Design principles (3), where we begin with what understandings we want students to end up with at the end of a unit, and work back from there. One could argue that this idea of designing curriculum backwards from what we want our graduates to be like, the Portrait of a Graduate, is the most critical component of this work. This year we are working with two outside consultants, Star Plaxton-Moore and John Traynor, to help us better understand how we connect our curriculum to the Portrait of a Graduate, especially with regard to Service Learning. As we document our curriculum through the five-step process and create our recipes, if you will, we come face to face with the following question: How do we know how our curriculum is working? To use the cookbook analogy, how do we measure the success of a recipe? We answer this question by looking at our students and measuring how they grow. Each teacher at St. Paul’s selects meaningful questions to explore and generate data on their own work to help them improve what they do, and this is called Action Research. You can think of it as a taste test or feedback about the cooking. Hardly anybody touched the mac and cheese. And those who did eat the mac and cheese said it was too salty. Good to know. Next year we need to ask the guests ahead of time who doesn’t eat dairy. And we need to jot down less salt on the recipe. So Action Research is our method of measuring how our curriculum is working, and it’s worth mentioning why it’s our chosen method. Why not just look at standardized test scores or where our students end up going to high school? The answer is that Action Research results in significant learning for teachers and students when teachers use it to better understand issues of social and educational equity. 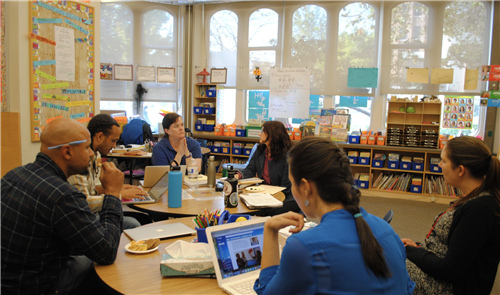 Promoting diversity and inclusion is at the heart of the St. Paul’s mission, and Action Research is the best tool out there to help us understand our teaching practices as anti-racist, anti-bias educators.